Fill a medium pot with 2 quarts water and bring to a boil. With a sharp knife, cut kernels off cob (about 2 cups). Place kernels in boiling water and blanch for 30 seconds. Remove kernels with a slotted spoon and place on a paper towel to absorb liquid. Pat dry and set aside. Toss potatoes in a ziplock bag with 1 Tablespoon olive oil and salt. Place on a shallow roasting pan in preheated oven and roast for 20 minutes until crispy on the outside. Meanwhile use a microplane to grate garlic into a small bowl. Add lemon juice, 4 Tablespoons olive oil and chopped parsley. Whisk to blend. Stir in corn. 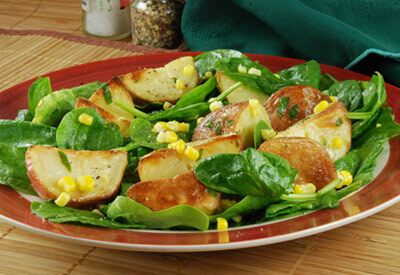 Place spinach in large bowl and toss with corn and dressing mixture. Add potatoes and gently toss. Season with freshly ground black pepper.